The evangelism for Biafra referendum moves to another dimension while the Nigerian oppressive government rely on the Igbo Political elites to advance the use of force to start election campaign in Biafra land. The Ebonyi state governor have imposed 2019 campaign levies on the Indigenous People and every business owners in Ebonyi state. Political thugs have been engaged to hunt market men and women and force them to obtain the PVC for the Nigerian 2019 election and the Tricycle riders have also been asked to pay a daily contribution of N200.00 and surrender their Tricycles to be repainted for David Umahi 2019 election campaign. Biafra media confirmed the report from Abakeliki province that Governor Umahi in collaboration with the transport Union in the state have insisted that all private owners of tricycles who fail to identify with the governor's re-election bid are no longer allowed to operate in the state. In reaction, the transporters bemoan the situation which they describe as oppressive. Biafran media gathered that the majority of the tricycle owners have sold family lands and other important personal belongings to start the business and now the governor wants to reap where he did not sow. It could be recalled that the Indigenous People of Biafra stepped out of any further dialogue with the Igbo political elites when Ohaneze Ndigbo failed to prevail over the governors in de-proscribing the Indigenous People of Biafra. IPOB have continued to uphold the trust and will of millions of Biafrans all over the world that Biafra referendum is the only election allowed anywhere in Biafra land until Biafra is restored. In ending the dialogue with Ohaneze, IPOB leadership pointed out that Ohanaeze and the Igbo Political elites were only working hard to drag IPOB into the 2019 election and Biafrans will never accept that. Biafrans in Ebonyi state however vow to intensify the evangelism for Biafra referendum as the only option to resist the oppression from the oppressive Nigerian government which David Umahi represents. 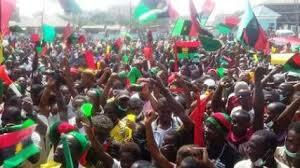 While the political elites advanced their oppressive approach to force the Indigenous People into remaining in Nigerian, Biafrans also vow to resist every attempt by the Nigerian government until Biafra referendum is conducted.